Santander is a worldwide active banking group that focusses on providing financial services to consumers, retailers and automotive companies. Santander asked Redkiwi to participate in a pitch to design their new responsive website. 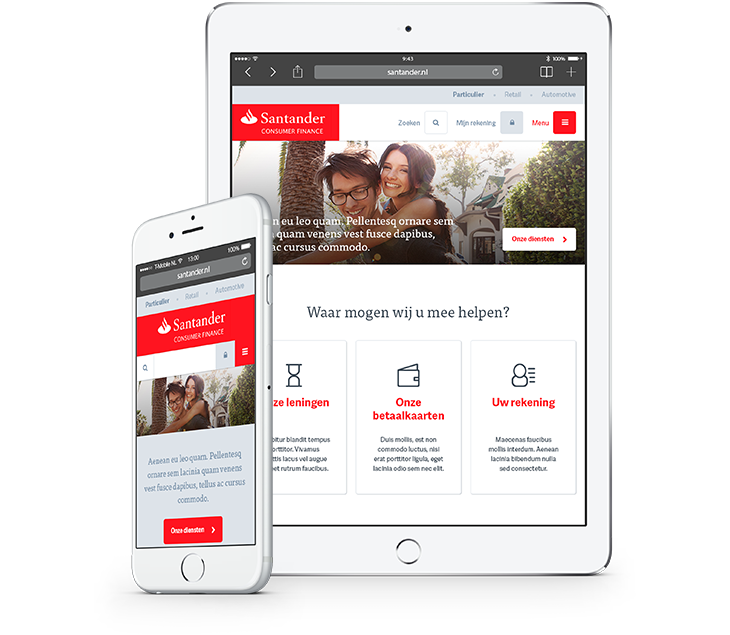 A new responsive webdesign for Santander should be more personal and less corporate. It should give visitors a good feeling about the company, reliability and the feeling that Santander is the right company to arrange their finances with. For the design proposal Santander provided us with three ways they communicate: human, friendly and clear. These communication goals got center stage in the design we created. When a user enters the website, it should be able to reach his goal as fast as possible. We made sure the services Santander provides are shown as early as possible. To give the site a more human feeling we have added pictures of smiling people in real life situations. These images will appeal to the user, humans, more then an image of a debit- or credit card. The design overall is made accessible. Light colors and lots of space in the design define a clear viewing experience. By adding a blue color to the red corporate identity a layer of professionalism is added. A big and clear font makes the text easy to read and effortless to use for all sorts of users. The design was made responsive to make sure every user gets an optimal view of the website. This way users can acces the website with the right view on every devices. If either the user is looking for contact information, wants to calculate the maximum loan ammount or wants to acces their account? Every device will provide a user interface that enables the user to reach their goal.